The Beasy Board Trans Easy Transfer System is totally portable. With the BeasyTrans Systems, most users can achieve regular access to an automobile. For some, this may mean a greatly enhanced quality of life. The visiting of friends and relatives may be resumed. Educational and cultural undertakings can be attended. The systems may even allow the user to live at home while receiving outpatient care, rather than living in a long term facility. The patented Beasy Board Transfer Board transfer technology places the user on a safe, circular seat. As the seat moves easily across the base of the system with the user on it, the friction of movement is borne by the system, not the user's skin. Consequently, shear forces and friction, present in some other transfer techniques and which cause or contribute to tissue breakdown, are eliminated. The design of the Beasy Board Transfer Board, Easy Transfer System makes it possible to apply sliding technology to a wide range of transfer and therapeutic functions in both the clinical and homecare environment. 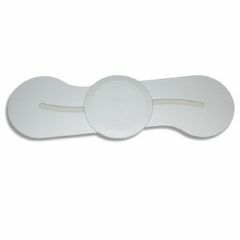 For example, strategic placement of the Beasy seat under a draw sheet allows a minimum number of caregivers to easily perform such difficult transfers as bed to gurney, supine, or boosting of patients. Because the seat easily rotates 360 degrees, the systems can be used for range of motion exercises for hands, feet or other body parts. The Beasy Board Transfer Boards are made from a combination of superstrong space age polymers which were developed by DuPont. The systems have been used effectively with patients weighing up to 400 lbs. without cracking or breaking. In addition, these strong materials can be cleaned by virtually any agent normally used to sanitize durable medical equipment, with no adverse effect on strength or performance. Be sure to check out the 32" Beasy Board Transfer Board. Please Note: Due to hygienic reasons and sometimes short recovery times, The Beasy Board Transfer Board is non-returnable. when it works, it is super!!! however, it isn't good for all places/situations. i still use my manual wooden board for some transfers. and, i really think it is over priced. This product is a great idea, yet it has a MAJOR drawback. On the bottom side of the board where the cover goes over the slide channel, the mfg has drilled holes completely thru the channels to add piins to hold the cover in place. These drilled holes are right in the middle of the board and create a stress riser. We have had 2 of t hese boards and both have cracked thru the middle. I contacted the mfg and told them about the problem and recommended a fix to this problem, it has fallen of deaf ears. Would love to buy another one because the idea is great but hate to pay this board and have it fail for the 3rd time. Therefore I would have to say this board will become junk with daily use. Safe. Sturdy. Easy Storage. Convenient to carry..
My daughter has lost both hers legs due to illness, and the board aids us in transferring from bed to transport chair and shower chair. Very useful. This product is well worth the price. Being recently disabled, I am practicing using the Beasy Board in the hopes of transferring to and from our car. What is the weight limit on this board? The spec sheet says about fourhundred lbs. On the Beasy transfer board do you carry it in the Microbial finish?